First of all, I’m SO excited because this is the 6-month anniversary of my blog and I never imagined how much fun I would have doing it. Thank you all for you comments, and shares, and likes; I really hope you’ve enjoyed sharing my thoughts every week! Second of all, I am pleased to announce that I now have a Facebook page! www.facebook.com/mythreescoops. Like my Facebook page for the easiest way to keep up to date with all my ramblings. I post 3 times a month on my website, but I will post a lot more on my Facebook page. 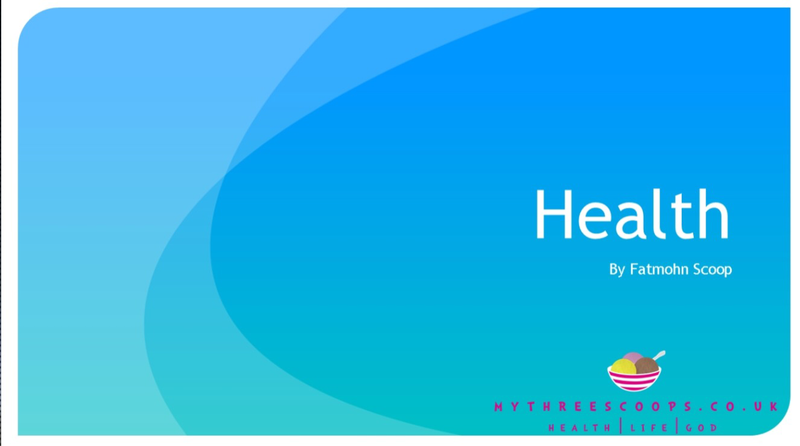 Third of all, I had the privilege of delivering a health talk at a women’s conference on the 22nd of August, so this weeks “health” post will be just that. I found a great website that let me upload my slides, but unfortunately my notes weren’t uploaded so I’ll list them below. What Is Health? – I chose these three definitions because they show that being “healthy” is not just the absence of disease, but more the lacking of completion. If you are in any state of “lack” whether in body, mind, or spirit, then there is a degree of unhealthiness that you carry. Thinking of “health” like this helps you to see yourself as a whole picture and address your health from every angle, not just how you “physically” feel. Stress – The main aim of this presentation is to show how stress causes so many illnesses in our bodies. Definition of Stress – Feeling stressed is all in our minds; when we think we cannot cope, we get stressed. When we think the situation in front of us is bigger than us, then we get stressed.As a Christian, being stressed is contrary to scripture just as worry is. When we remember we have the creator of the world living inside of us, what is there in our situation that is bigger than the God inside us? He provides and watches over the birds in the air, so surely he loves us, his children who he gave his life for! If we focus on how the bible tells us to avert worry, the stress in our life will be greatly diminish. Common health problems in the Afro-Caribbean society – Diabetes – being overweight causes inflammatory markers to be produced that stick together causing scar tissue & plaques & reduce insulin sensitivity. Insulin moves glucose from blood to cells to be used as energy; reduced insulin sensitivity means more sugar circulating in blood. A 5% reduction in body weight + moderate intensity regular exercise = 50% reduction in diabetes riskA lot of oils that are processed produce inflammatory markers – the best oil to cook with is organic extra virgin olive oilOur traditional diets are exceptionally high in carbohydrates. A carbohydrate rich diet can contribute to developing diabetes and high blood pressure because, in the body, carbohydrates are changed to sugars – triggering hyperinsulinaemia which triggers the sympathetic system hence increasing the blood pressure and blood sugar.The relaxers we use on our hair have been scientifically proven to increase the likelihood of developing fibroids. What I now Cook in My House – COLOURS – This diet in rich in fiber and nutrients. Eating as much food “raw” as possible with mean you are getting the best from your food!My health, vitality, and energy levels have shot through the roof eating more fish, fruits, and vegetables and my bowel health is amazing. Did you know that if you are eating healthily, you should pass a stool at least every 12 hours? Anything longer than that, and toxins are staying in your system for too long. Don’t forget to like, comment, share & subscribe!